To cater the growing demands of Ceramic CPU Scrap, we bring forth the finest range of CPU scraps for the buyers in the domestic and international markets. Our Ceramic CPU Scrap is procured from reputed vendors of the domain. Before their final dispatch, the scrap is tested on various parameters to ensure their quality, effectiveness and purity. 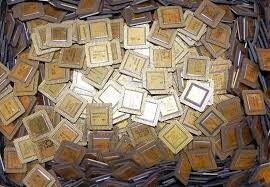 We are a prominent Ceramic CPU Scrap Exporter and Supplier from Thailand. We make the available in various specifications and grades. Also, they can be acquired from us at reasonable prices.